This March 2008 post is long overdue for an update as, since the original post, it's been lovingly resurrected by the always awesome New York Review Children's Collection. I pulled it out last night to read to my son's best friend during dinner and I never EVER tire of surprising a child with this story for the first time. The way their eyes light up in disbelief. My son, still, after a hundred plus reads, gets whipped into a frenzy of awesome by the end. Classic. It's definitely in my top five favorite children's books of all time. The drawings are so fabulous and detailed and quirky, that three years later, my husband and I still find new things on every read. I love Make Way for Ducklings, One Morning in Maine and Blueberries for Sal, but I'm of the personal belief that, as an artist, this one is McCloskey's masterpiece. So welcome to Update Friday, the day when I take an old post and dust it off and make it new again with all new scans and fancy commentary. 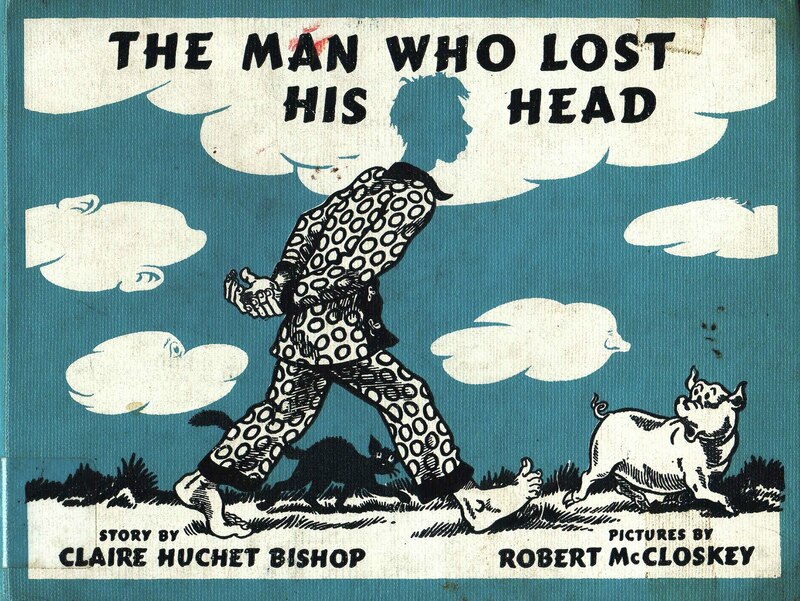 For your viewing pleasure... here is The Man Who Lost His Head by Claire Huchet Bishop with pictures by Robert McCloskey; updated for a new decade from my ratty old ex-library addition. Have at it. Thanks for updating this! I have to get this for my kids--they love when people lose their heads (in books). I love this post! I love this site. I don't remember how I came to here (clicking around), but when I saw the first page with McCloskey - I froze. Of course, McCloskey is a favourite of mine and my kids. We've got almost all of his books, but my kids are only 3y3m old and to date I read to them only Make Way for Ducklings, Blueberries for Sal and One Morning in Maine. The Man Who Lost his Head (the new NYRB children's collection edition) is standing in our family library waiting for them to grow up a bit more (I don't want to shock them too much with a man without a head yet), but I can't wait to start reading it aloud. What is your experience? Is this book OK for 3-year olds? Well, this was just a first comment, I'm going to look around this site now (and subscribe!). Well RAD, from browsing around your site you obviously care a great deal about your kids and books which is awesome! I am the wrong person to ask about age appropriateness though. My son will read anything... the only time he's been known to turn something down was if it was just really crummy. That said, I reviewed this book when my son was three, so that means he was loving it back then. I'm not much at censoring my son from scary or different stuff as if it is too scary he will tell me straight off. He'd listened to all the Harry Potter books on audio before he turned 5. He's an only child, so audio books are kinda his best friend. Last night he was in a play and backstage he and his friend were coloring and listening to the audio of Narnia's Silver Chair on headphones and a girl from the play asked him what his favorite thing to do was and he answered "The two things I'm doing right now". He's always had a real common sense about what's real and what's not, so there are not many books I wouldn't read to him. His best friend is the same way, but they both have tons of friends I wouldn't dare read something a little spooky to. I really think it varies from child to child. You know what your kids love and what they can handle so just follow your gut. Many times when I've held something back from my son, I forget about it and by the time I remember, he's outgrown it, so I'm one for throwing everything out and seeing what sticks. Luckily I have a son who truly loves books. At five now, he'll sit happily and read a stack of baby board books just to see the pictures, he'll beg me to read dozens of picture books throughout the day and he'll spend hours listening to Tim Curry read Peter Pan on audio and has my husband spend an hour each night before bedtime rereading him the Harry Potter books. ( They just started book 7.) I'm just psyched to see where he takes it all once he really starts reading for himself. My son has a real excitement and love for just about everything at this point... science, nature, animals, music, school, art, drawing, make believe... and I know that comes from reading to him early and often. Who knows what sort of person he will grow up to be, but at this point I feel pretty confident that he'll always love books. Though I know I could have never forced him to love them, if you have a passion for something, your children can't help but he affected by it. So keep reading and loving those beautiful kids. Any parent who takes the time to teach their little ones to love books is a hero in my eyes. I adore this book. In the late 90s and early 2000s I would mention it to other bookish people and they frequently asked me if I was smoking crack. They didn't believe me that it had ever existed! Thank god it's back in print so I am vindicated! Robert McCloskey rocks. I LOVE the ex-library editions--that's part of what makes it so nostalgic. Plus looking at the marks and tears on library pages and knowing for sure that some other kid has had their grubby little hands on it and loved it!